This past weekend, we went camping in Jackson, Wyoming. I may write more about the whole thing, but the moment I'm really trying to capture was on the way home. 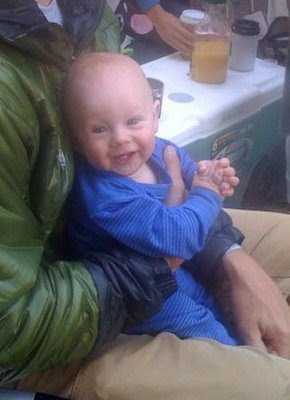 It was a lot of fun to go camping for the first time with Gabe. Lucy, of course, has been camping before. We went with good friends and also brought rafting gear so we could run the Snake. On the way home, Brian drove, as usual, and I spoiled myself by reading (since it's so hard to do most of the time for me). We had some delicious music going and with the passing landscape-- the open western hills, greened-up with all of the recent rain and late-afternoon warmth lighting the clouds, the drive couldn't have been better. Lucy and Gabe were in the back, at opposite sides of the truck, peaceful. I was at a pivotal point in the book and completely immersed, only barely aware of the music and continual passing beauty. Then Gabe started these big belly laughs (that I want to record every time I hear them). Lucy, giggling. This pulled my attention from the book enough that in my peripheral vision, I glimpsed a pillow flying. I glanced back and saw what was making Gabe laugh. Lucy was chucking a full-sized pillow at Gabe. Every time it hit him, he laughed that deep belly laugh of his. I looked at Brian: Just driving, a subtle smile on his face. A while ago, I filled out a form on a site that was supposed to track the traffic on my blog for free. There was also an option to upgrade to a better version for a nominal fee. I opted for the free version and soon started getting email notification that no one ever visits my blog. Not even me. This ended up being liberating. Now that I know this is a private space, I can unleash my thoughts, however eccentric they may be. This post is all about just clearing my head and indulging the higher functions of my brain that don't always see a lot of action these days. Lately I've been thinking a lot about consumption. About what a machine we as a society are for consuming non-consumable goods. Of course, I'm using "consumable" in the "liable to be used up or depleted" sense, not the "edible or drinkable" sense. This most recent consideration was brought on when I read this. Read it. We buy things that should or could last 10 - 20 years and are "done" with them in a few months or years; sometimes we're done with them in a few days. It's done in the name of fashion, style, and progress. We get "tired" of things, there are improved or newer versions, so we discard them, give them away, or store them to make room for something new. Is it a product of advertising? All to make more money so we can buy more stuff. Why are we so hungry for more and more and more? Sometimes I get a little queasy thinking about all the stuff in the landfill. I'm actually not opposed to landfills in general, just over-the-top consumption that fills them. I guess this is a recurring theme in my thought process. In typing the previous paragraph, I remembered a multi-media thing I put together after I got home from my stay in Senegal (eons ago). Same thing. This leads me to this pool of thought: am I guilty of hypocrisy--noticing this and at the same time remaining part of the problem? Sure, I could be a bigger part of the problem. But I'm still part of the mainstream. I still buy and own a lot of extra everything. For me, I've realized that I want my standards to change. I want to slow the process of acquisition and the rate of turnover. I want to slow my consumer metabolism, if you will. This means holding out for best instead of buying good, then better, then best. This means being more thoughtful about how I will use something before I purchase it. This means more planning and less impulsiveness. In short, it means growing up a little. Sometimes I wish I lived in a world where self-discipline weren't an issue. In this world, no one would be fat or have bad teeth. Everyone would have a wonderful compost pile. Everyone's birthday would be celebrated thoughtfully. No recyclables would be sent to the landfill. But I guess what I would gain might not be more than I would lose in character and personal growth. Last night, after Lucy had gone to bed and Brian had done what he could with the flagstone in the remaining daylight, he sat down to have some dinner. Dinner happened to be pork roast with potatoes, carrots, and onions. Gabe was very interested in what was on his daddy's plate, so I gave him a taste. He LOVED it. Roast, carrot and potato. His favorite was the carrot, cooked to tenderness in the juices of the roast and onions. He ate it all. After this, he made it clear that he needed something else. Turns out, what he was missing was a nice long drink of water from his father's glass. Really, though. There is something to that. If I continued to buy into that perfection thing, I would be able to count my blog posts on one hand. Anyhow, the aim of the blog is to work as a journal, not a lasting literary work. So I post. I'm going to resist the temptation to catch up from where I left off. Today has been nice. Not completely nice, but nice. The un-nice parts of it were/are: my own lack of sleep and Lucy's drama. These ended up being just a blip today. Nice. Other news: we have new neighbors. ...They seem really great. They have a daughter named Zoe. We have a dog named Zoe. She is about my height, and he is about Brian's height. We really liked our other neighbors. We will miss them. Our new neighbor plays professional basketball overseas, which means he and the rest of the family will be gone relatively lots.